Part of the fun of being an electrical or computer engineer is designing and building new things. So it is not surprising that we spend a bunch of time making things in our courses. Here is a partial and growing list of recent projects from our regular and capstone courses. Military pilots operate under stressful conditions that place stringent demands on their attentional resources. Their ability to respond rapidly and accurately to relevant stimuli while ignoring extraneous information is critical to mission success. Currently there are no widely-accepted tools for measuring the mental workload of pilots engaged in flight tasks. A quantitative index of cognitive loading would be immediately useful in pilot training, selection, and screening for mission-readiness. In the longer term, it might also be applied in optimizing cockpit designs and developing novel “pilot-in-the-loop” aircraft control systems. The goal of this project was to develop an algorithm to measure mental workload in pilots based on brain signals recorded noninvasively, and without the need for an externally introduced auditory probe stimulus. 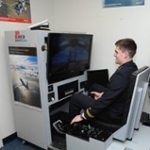 Several signal processing and machine learning techniques were compared based on their performance in classifying simulated flying challenges of varying complexity. Johnson MK, Blanco JA, Gentili RJ, Jaquess KJ, Oh H, and Hatfield BD. 2015. Probe-independent EEG assessment of mental workload in pilots. Proceedings of the 7th International IEEE EMBS Neural Engineering Conference, 581-584. 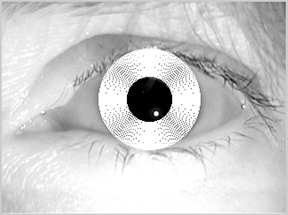 An efficient parallel architecture design for the iris unwrapping process in a real-time iris recognition system using the Bresenham Circle Algorithm is presented in this paper. Based on the characteristics of the model parameters this algorithm was chosen over the widely used polar conversion technique as the iris unwrapping model. The architecture design is parallelized to increase the throughput of the system and is suitable for processing an inputted image size of 320 × 240 pixels in real-time using Field Programmable Gate Array (FPGA) technology. Quartus software is used to implement, verify, and analyze the design’s performance using the VHSIC Hardware Description Language. The system’s predicted processing time is faster than the modern iris unwrapping technique used today. 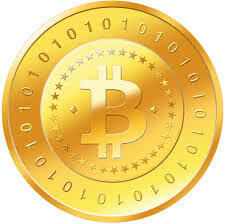 The purpose of this Capstone Design is to analyze the energy efficiency of Bitcoin mining, specifically with respect to the SHA256 Hash Function. By implementing the SHA256 function in both C/C++ and C/C++/CUDA, energy efficiency is computed and compared to determine an optimal design. Abstract: The purpose of this project was to interface an RC Hex-rotor (MikroKopter) with an Android smartphone via USB communication. 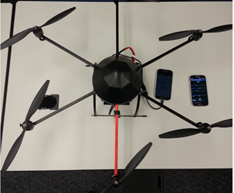 By enabling a smartphone to give flight commands to the RC rotor, a platform for future development was created. The work was split into two teams, with a Computer Engineering team working on the hardware interface and a Computer Science team working on writing a friendly user interface (UI). Using a software application (app) written for Android, the MikroKopter was controlled by a phone mounted on the chassis that received wireless commands from another smartphone. Then, through the use of the Google Maps Application Programming Interface (API), a UI was created to plot a search area that would be patrolled by the rotor. Ultimately, the Hex-Rotor was able to fly autonomously without the use of the RC transmitter. 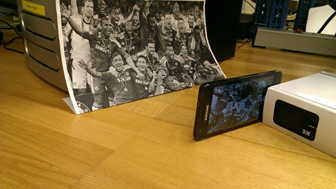 The addition of a smartphone created a system capable of rapid future development. The transmitter, however, was still necessary for initialization. This project focuses on studying the performance of the Android operating system when using different governors. Utilizing an automated testing procedure, the phone runs through a series of typical usage apps and specifically, a facial detection app. The goal is to find which settings help the phone and battery perform the best. The results showed that OnDemand performed the best in the two tests. Performance tended to be too much power for the tasks. Powersave was slow and cumbersome, however in the facial detection test it could be improved upon to achieve low power with good performance. 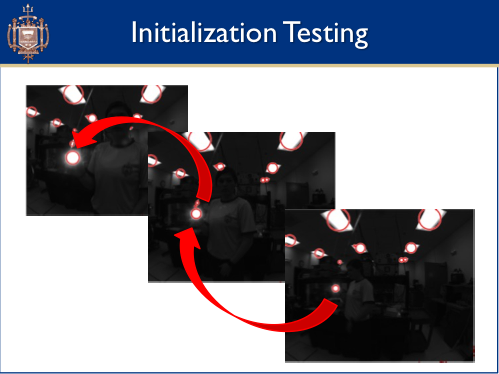 GPU and CPU implementations of various steps of an iris recognition algorithm were used to compare energy efficiency of these different implementations. In the case of template matching, mostly-consistent results yielded a speedup of approximately 40 for GPU implementation over a single-threaded implementation. This speedup results in substantial energy savings, even if ignoring the large difference in background energy use that results from the different amounts of time. Migrating to a modern GTX980 GPU yields another 40% speedup, and even greater efficiency gain due to lower power, versus a GTX580 GPU. In all other cases, timing inconsistencies point to underlying problems in the simulation code and compilation which make the data not usable. This deficiency was partially addressed with entirely new code which runs the inversion process in a more straightforward manner. This code can be easily adapted to address thresholding, dilation, and erosion. A correct amount of computation to send to each CUDA core in order to get the ideal combination of overhead and parallelism advantages has still not been determined. A neural network based algorithm is created and used to analyze windows of an image, performing face detection across the entire image. The algorithm is then ported to an application created for mobile devices running Google's Android operating system. Abstract— Underwater optical systems have real potential in the domain of wireless underwater communications. However, beam propagation through water is not well understood. While success has been achieved modeling the underwater channel using Monte Carlo methods, underwater beam propagation has, to our knowledge, yet to be fit to a true probabilistic model. This paper investigates the utility of the Lognormal, Weibull, and exponentiated Weibull probability density functions in modeling the underwater channel, using parameters developed for the free space domain. 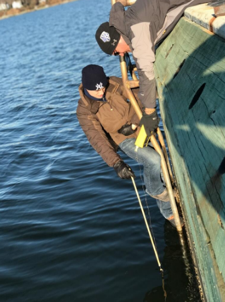 Beam propagation is tested under various salinity, temperature and turbidity conditions, and compared with brackish water from the Severn River. M. Bernotas, and C. Nelson, "Probability density function analysis for optimization of underwater optical communications systems." OCEANS'15 MTS/IEEE Washington (2015). 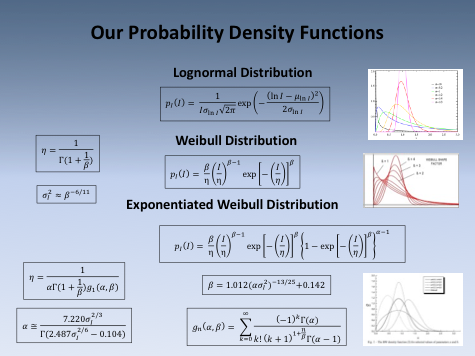 Abstract— The Weibull and Exponentiated Weibull probability density functions have been examined for the free space regime using heuristically derived shape and scale parameters. This paper extends current literature to the underwater channel and explores use of experimentally derived parameters. 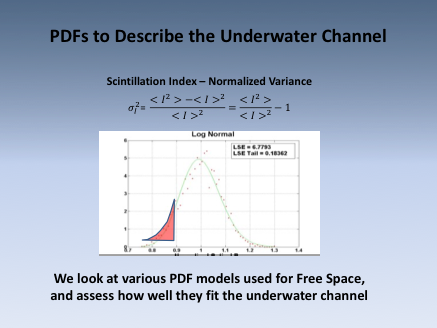 Data gathered in a short range underwater channel emulator was analyzed using a nonlinear curve fitting methodology to optimize the scale and shape parameters of the PDFs. This method provides insight into the scaled effects of underwater optical turbulence on a long range link, and may yield a general set of equations for determining the PDF for an underwater optical link. 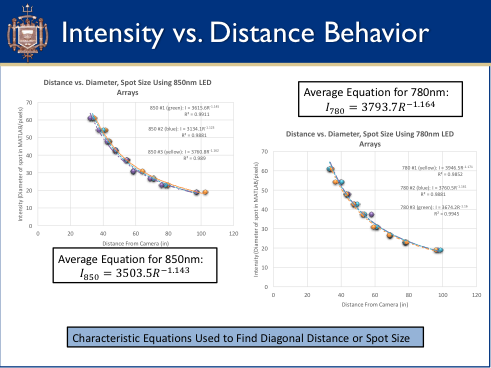 M. Bernotas, and C. Nelson, "Probability Density Function Analysis for Optical Turbulence with Applications to Underwater Communications Systems." Proc. SPIE 9827, Ocean Sensing and Monitoring VIII, 98270D (2016). Abstract— it is well known that photons exhibit momentum due to relativistic mass. Besides linear momentum, angular momentum is also associated with photons. This angular momentum is characterized in two forms, spin and orbital. Whereas spin angular momentum deals with polarization of the photon, orbital angular momentum deals with a photon’s phase, and thus the wavefront of a light source. Orbital angular momentum can be imposed on a beam of light utilizing a spiral phase plate, forming a helical wavefront and producing an optical vortex in the center of the beam. 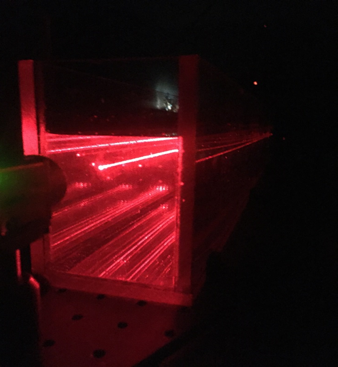 This research analyzes the propagation of an orbital angular momentum beam underwater in comparison to a Gaussian beam under calm and turbulent conditions. 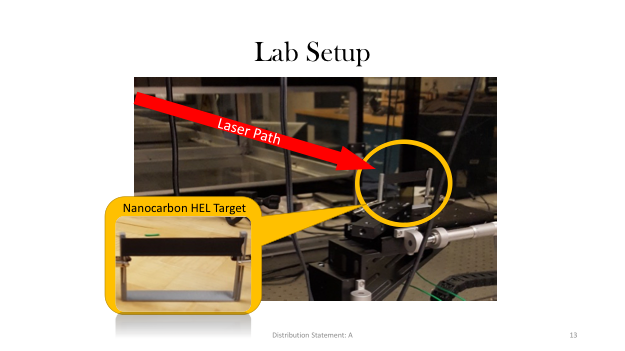 D. Jung, C. Nelson, “Underwater Propagation of Orbital Angular Momentum Laser Beam.” EE496 Independent Research course final report, United States Naval Academy, 2016. Abstract— Over the course of six months, from January of 2015 through June of 2015, atmospheric optical turbulence measurements were made in a 3.9 km maritime optical link located on the coast of San Nicolas Island, CA. Throughout the same period of time, weather parameters were measured on and around the island. The resulting data was compared to atmospheric measurements taken over the Chesapeake Bay by Navy Research Labs and Research Support Instruments Inc. from January of 2007 through June of 2007 in order to investigate similarities and differences between atmospheric optical turbulence behaviors in a range of maritime environments. 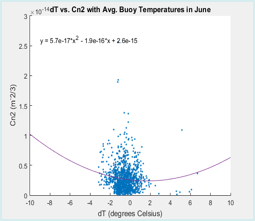 Monthly mean values of Cn2 differ significantly in magnitude, however, follow similar trends over time. The lack of obvious diurnal variations on San Nicolas Island confirmed theories about trends observed over the Chesapeake Bay. 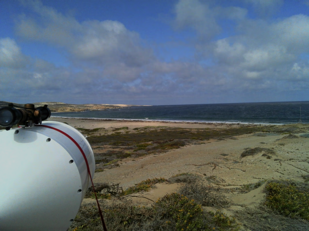 Additionally, Cn2 was found to have less of a dependence on air-minus-water temperature on San Nicolas Island than over the Chesapeake Bay. 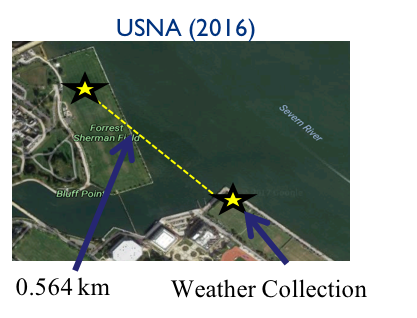 Results from the comparison of both environments highlight a need for continued investigation into the modeling of atmospheric propagation in a range of maritime environments, as well as near-maritime and littoral environments. Abstract— Instantaneous personnel location presents a challenge in Department of Defense applications where high levels of security restrict real-time tracking of crew members. During emergency situations, command and control requires immediate accountability of all personnel. Current radio frequency (RF) based indoor positioning systems can be unsuitable due to RF leakage and electromagnetic interference with sensitively calibrated machinery on variable platforms like ships, submarines and high-security facilities. Infrared and visible light provide a possible solution to this problem. This paper proposes and evaluates an indoor line-of-sight positioning system that is comprised of IR and visible light transmitters and high-sensitivity CMOS camera receivers. In this system the movement of the LEDs is captured by the camera, uploaded and analyzed; the highest point of power is located and plotted to create a blueprint with beacons designating crew members’ locations. Results provided evaluate accuracy as a function of both wavelength and environmental conditions as well as target movement profiles. 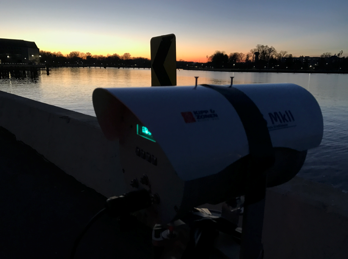 Research will further evaluate the accuracy of the LED transmitter and CMOS camera receiver system. 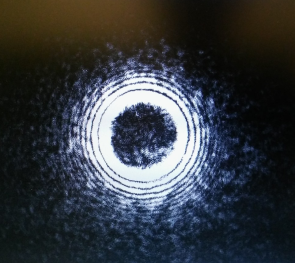 Transmissions in both the 780 and 850nm IR bands as well as visible light spectrum are analyzed. Abstract— Current technological advancements in directed energy weapon systems create a growing need for effective and innovative countermeasures. 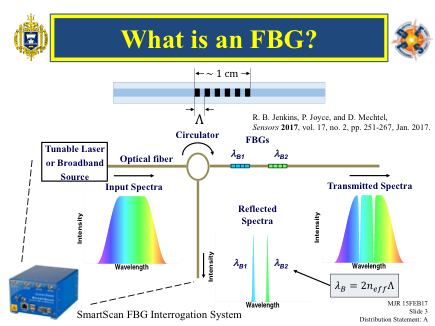 One potential method of detecting high energy laser attacks on aerospace drones or Unmanned Aerial Vehicles (UAVs) is to embed a network of fiber Bragg grating (FBG) temperature sensors within the composite skin of a vehicle. 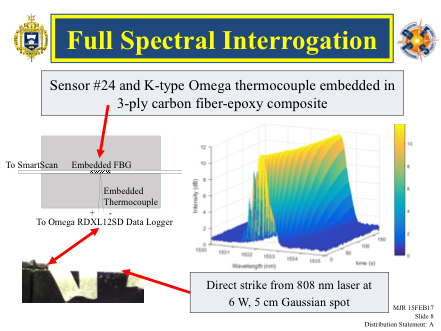 In these experiments, uniform 1530 nm fiber Bragg gratings and Type K Cr-Al thermocouples were embedded in three-ply carbon fiber composites. 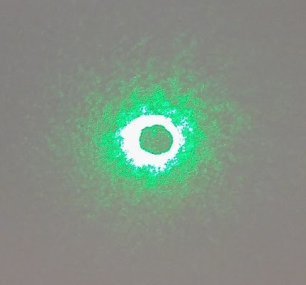 High energy laser weapon attacks from tactical distances were simulated using a 100 W 1060 nm laser at laboratory distances. 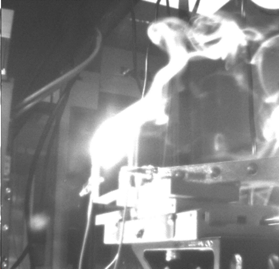 FBG spectral data and thermocouple temperature data were collected during each of the 11 high energy laser tests conducted. These data are analyzed to explore the speed, precision, and thermal decay of these embedded sensors when exposed to the high temperatures associated with directed energy applications. J. A. Piepmeier, C. S. Olsen*, and S. L. Firebaugh, “Uncalibrated visual servo control of magnetically actuated microrobots in a fluid environment,” Micromachines, vol. 5, no. 4, pp. 797-813, 2014. C. House, J. Piepmeier, J. Burkhardt, S. Firebaugh, “Analysis of acoustic actuation for microrobotic propulsion in low Reynolds number environments,” Proceedings of the SPIE Defense + Security Symposium, Baltimore, Maryland; 20-25 April, 2014. Researchers are working on developing enhanced intravenous (IV) catheter needles that incorporate sensors for various biophysical markers. Such devices could be particularly useful in emergency medical treatment in civilian or military applications. These needles will be similar to conventional IV needles but may require additional handling and instrumentation for peak utility.